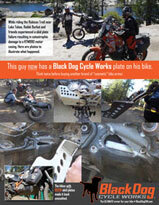 Black Dog entered the BMW market in 2010, several years after the first R1200GS hit the market. Once we bought this bike we quickly discovered that it needed an ULTIMATE Skid Plate. Nothing on the market met the standards we had established for our plates. This bike had some glaring issues that we quickly identified and remedied with the best plate design to enter the arena. We took the mounting points off the engine case (yes, BMW and many aftermarket skid plate manufacturers mounted them into the case with rubber shear bolts) with a unique mounting system of a cross bar in the rear across the frame and front mounts that were designed to take the impact of major hits. We topped it off with two rubber Shok-Bloks beneath the engine case to absorb some of the impact. All and all this plate has become the most popular plate with the extreme riders because it stands up to the abuse they give it off road. We also were the first manufacturer to offer replacement parts for a damaged plate instead of having to buy a whole new skid plate. Compatible with engine bars from BMW, Hepco-Becker, Touratech, SWMotech, Altrider and Wunderlich. If your crash bar manufacturer is not on this list, please email us or call. 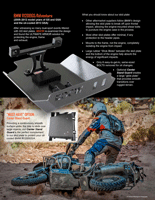 Compatible with all popular tank guards. So I finally got the chance to really test this skid plate now that summer is here. Easy to follow installation instructions and looks great on my machine. I was out on a decommission road in the Rocky Mountains and essentially bottomed our the bike into a massive rock. To say the least the bang concerned me until I looked at the skid plate and there was like nothing - maybe a little scuff. I highly recommend this product if you are taking your bike off the road most travelled and into what I call the fun stuff.